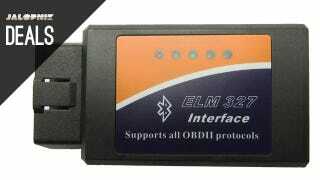 This Bluetooth OBD II scanner is only $7 right now on Amazon. It's compatible with the Torque Android app (and those like it), so you can turn your smartphone into a massively-powerful, car-monitoring computer. Get all of the best deals in one place in today's edition of Kinja Deals. KIND Healthy Grains Granola Bar, 5 Count ($7) | Amazon | Clip the 15% coupon and sign up for Subscribe & Save for additional savings. This post is brought to you by the Commerce Team, a dedicated group of deal hunters and product enthusiasts. We operate independently of Editorial to bring you the best bargains every day, share our favorite products with you, and ask you about yours. When you buy something we recommend, we may also get a small share of the sale. We welcome your questions and want your feedback.